Alyssa's Ark Small Animal Rescue is a no kill animal shelter located in Brandon, MB Canada. We are dedicated to taking in, rehabilitating and rehoming abandoned, unwanted or homeless small animals. We DO NOT take in dogs and cats. Due to the legalities and city bylaws, we are unable to take in cats and dogs. There are currently two dog/cat rescues located in Brandon, Funds For Furry Friends and the Brandon Humane Society. 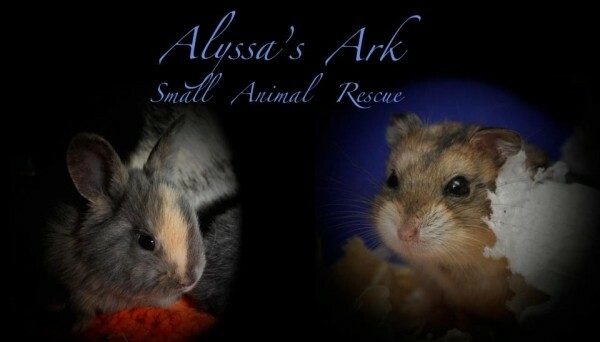 Alyssa's Ark was started so the smaller animals that these two rescues don't accommodate, have a place to go. When I graduated highschool, like most people, I didn't know what I wanted to do with the rest of my life. After spending a year on college in Winnipeg I realized the big city wasn't for me. I moved to Brandon in the spring of 2010. A few months later I acquired 2 older gerbils that the previous owner could no longer care for. Shortly after, my friend, who worked at a vet clinic contacted me about a rabbit they had that was going to be taken to the pound. Having previous rabbit experience (having my own) and a spare cage, I said I would take her. After some research, I realized there was no where for small animals to go if their previous owners could no longer care for them. After a lot of thought and going to City Hall to figure out the legalities behind it, I decided to start a rescue myself. I started advertising on ebrandon and created a facebook page to keep people up to date on what was going on and what animals were up for adoption. Everything just snowballed from there. I have, to date, found homes for 13 rabbits, 2 hedgehogs, 6 rats, 3 hamsters, 7 guinea pigs, 2 budgies, 1 chinchilla and 7 degus. What started as a couple cages, grew to take over my entire living room! All expenses including food, vet bills, bedding, cages, cleaning supplies and rent for my house where the rescue is located, comes out of my own pocket. I have made a commitment to myself and the animals to try my best to make a difference. At the age of 20 I have realized my purpose in life. A lot of blood sweat and tears have been shed to get the rescue to where it is but I wouldn't change a thing. Every time an animals find a new home, someone donates or says I am doing a good thing, I am filled with joy. I have found a purpose in life and that is to help animals in the best way I can!